I play games near constantly, so it’s rare when I come across a board game I’ve never heard of, especially when it’s been around for hundreds of years. According to Wikipedia, Tafl is a game of Celtic and Germanic origin and was spread throughout Europe by the Vikings. Tafl was popular throughout the Middle Ages, but fell out of favor around the 12th century when chess came around. The word “tafl” just means “table” or “board” in Old Norse, and there is actually no single Tafl game, but rather a series of related games. The size of the board and the number of pieces involved are all different, but the pieces are all subject to the same rules of movement and always have an unusual 2:1 ratio of offensive pieces to defensive pieces. The defensive side controls a king piece which starts in the center, and the objective of the defensive side is to get the king to one of the corners, while the offensive side attempts to capture the king. All pieces in the game, including the king, move like rooks in chess; you can move as many spaces as you like horizontally and vertically, but never diagonally. The center square can only ever be occupied by the king, but other pieces may move through it. Capturing pieces works somewhat like Reversi and Othello. If, say, a white piece becomes surrounded on two opposite sides by black pieces, the white piece is captured and removed from play, but unlike Reversi/Othello, you can only capture a single piece that way, not a line, and surrounding a piece on the diagonal does not count. Like chess, the rules are not actually difficult to master, but there’s a surprising amount of strategy involved, particularly because of the uneven piece distribution, and I was both delighted and impressed by this ancient and challenging game. This universal Tafl app is actually quite nice and includes 7 different board layouts for the iPad version and 4 for the iPhone. The interface has a clean and elegantly masculine display, and the developers have done a reasonable job of explaining the game, addressing potential rule ambiguities, and including some of the game’s history. In general, I was quite pleased with Tafl, but the app is not without its flaws, unfortunately. In particular, playing against a computer opponent is often awkward at best, since there are no difficulty levels to select from, and the computer has a tendency to make incredibly stupid moves from time to time. 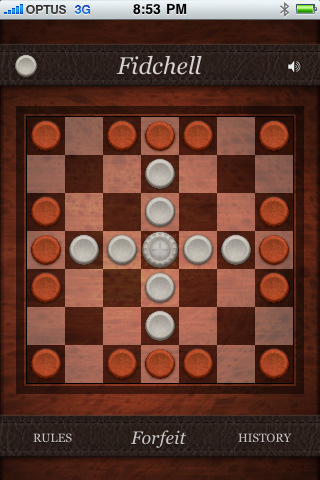 It is also possible for the game to get locked in a stalemate, which may or may not cause the game to crash. And while the pass-and-play option worked fine, I was disappointed that there didn’t seem to be an option for online play against human opponents. Tafl certainly won’t be for everyone. If you think chess and backgammon are hopelessly old and boring, don’t even bother, but if you’re the kind of deep thinker who loves engrossing games of strategy, Tafl is definitely a worthy addition to your gaming lineup. 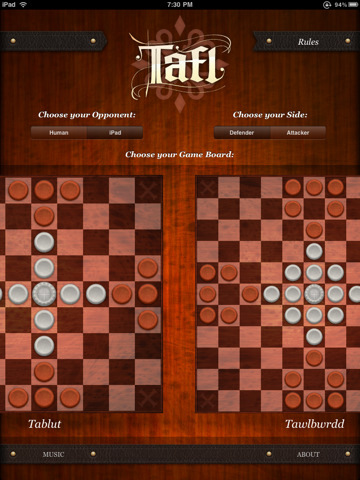 AppSafari review of Tafl was written by Tracy Yonemoto on October 4th, 2010 and categorized under App Store, Board, Games, iPad apps, Multiplayer, Puzzler, Strategy, Universal. Page viewed 4305 times, 1 so far today. Need help on using these apps? Please read the Help Page.